• Are the babies dormant, or something? Because you’d think Caroline would notice if she started to crave blood-dipped pickles or experience creature-of-the-night morning sickness. • When will this show stop forcing things onto Caroline? Back in Season One, she was repeatedly raped. Then she was in-vampired. Now she has been forcibly impregnated. • How does this surrogate pregnancy lead to Caroline and Alaric getting engaged? I can’t quite picture them in love, although I can see them doing it for the kiddos. • Can we expect some sort of awkward babies-in-peril plot as Valerie tries to work through her grief about losing her own child? But the party scene was a bit odd. Why did TVD have Our Heroes empty Mystic Falls, only to fill it with out-of-towners for party occasions? Does the blood-farm (at the high school) mean that Our Heroes now have carte-blanche to kill the Heretics, since they broke the no-killing rule? 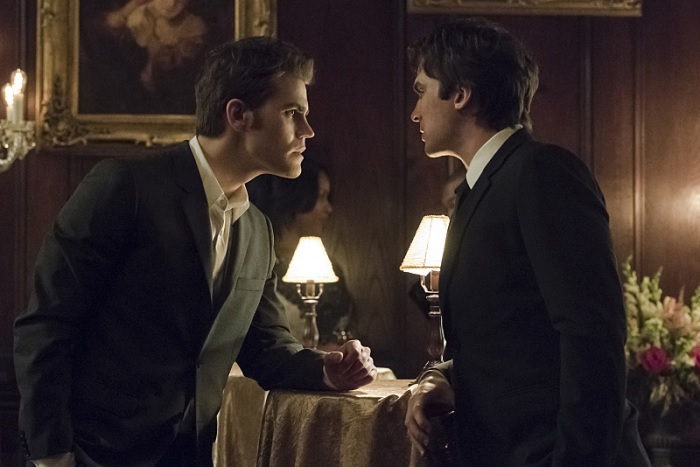 The episode took a real turn for me in the Stefan/Damon/Julian fight. As Stefan and Damon realized their mother is dating a man just as—or more—abusive than their father was, they went from vindictive and plotting to desperate to save themselves; the heightened emotions of that scene seem to be drawn from their own history of being abused. And that desperation in the face of (analogic) parental abuse was an interesting counterpoint to the opening scene, in which Stefan dreamed about the sort of father he would have been. That becomes even more sad when we think about the flashforwards: Stefan and Caroline aren't speaking, which means Stefan can't even be an uncle to the littlest Saltzmans. Damon doesn't seem to have a relationship with them, either, despite his longing for a real, albeit dysfunctional, human family with Elena. These are grown-up sized regrets. • “Revenge is a dish best served cold”: I’ve heard it attributed to Les Liaisons dangereuses by Pierre Choderlos de Laclos, and to the Klingons. • I did enjoy the really snarky way that Lily greeted everyone as they entered the party. • I really liked NotJo, Florence who was killed by a mystical sword. She seemed smart and interesting. Her goodbye with Alaric was quite sweet. Goodbye, NotJo. I always enjoy your TVD reviews, Josie. Gotta love a mystical pregnancy. :) Actually, I usually hate mystical pregnancy plots, but this is Caroline and Alaric and somehow that makes it okay with me. Oddly, this is also the episode where I realized I wasn't missing Elena at all. It's not that I'm not fond of Nina Dobrev, because I am, but maybe they'd done everything possible they could do with her character. Maybe the Salvatore brothers are enough for me now. I still can't stand their mother, though, and the heretics are still doing nothing for me. It's funny that you mention that the Enzo/Bonnie thing is growing on you, though, because it's also growing on me. Maybe it's the possibility that Enzo actually has taste? Yeah... I love Alaric, but he is too old for Caroline. He was practically Elena's father for a while, and she's the same age as Caroline. And Caroline doesn't age so she's basically permanently 17. Gross.